Of Grosse Pointe Woods, Age 101, October 19, 2018. Born in Chipley, Fl to Rev. F.F. and Louise Schell. Beloved wife of the late Fred Russell. Loving mother of Donald (Irene) Russell and the late Cathy (Jakob) Maerzluft. Dear aunt of Doug (Diane) and Dave (Sherry) Russell. Cousin of Cynthia White. A Memorial Service will be held at Crosspointe Christian Church, 21336 Mack Ave., Grosse Pointe Woods, Saturday, October 27, 2018 at 10 am with visitation and refreshments following. Please share a memory of Eleanor on her Tribute Wall. To send flowers or a remembrance gift to the family of Eleanor S. Russell, please visit our Tribute Store. 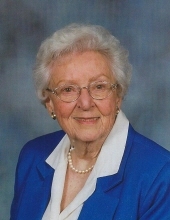 "Email Address" would like to share the life celebration of Eleanor S. Russell. Click on the "link" to go to share a favorite memory or leave a condolence message for the family.